For the people in mountain region , wine is an ambrosia drink which appears in all households . When there is a distinguished guest , wine is something indispensable drink to offer. The wine is customarily served with a saying . " please , have a flat wine with our family ," but you should not say no to upset the host family . If you have change to visit Lao cai , let come to Bac Ha highland where you would experience weather of four seasons with clouds covering all over the mountains. There , you would enjoy various specialities of nature of product made by the most unaffected farmer such as the Tam Ho plum , Hau plum , pear , local peach and French peach .In winter let be confident to enter any household sitting by warm fire and a cup of wine offered by the house master. The wine is made of the most natural maize grown in a mountain of Bac Ha . It spicy taste and aroma seem to give you a living inspiration despite the hardest challenges of life. And then you will wonder how people can produce such limpid and pure wine from their land , water and crops . You could ask Mong people in Ban Pho who are eager to give you all the story that the wine is made from plum golden maize boiled to a pulp in wooden fire then poured on a clean ground . The maize then would be mixed with kind of fermented leaves cut from the forest nearby . Three day after the maize become permeated with such ferment , it would be poured into a jug for soaking tightly in seven or nine days then distill for wine . That's really a kind of distilled wine but not brewed wine, because its quintessence is not brewed with water like the rice wine is done by people in low -land region but the wine is cooked in a bain-marrie . Water steam from containing th quintessence making up the wine which be cooled down by cold water container upper before running drops by drops to dried gourd or bamboo tube , Three bushels of maize can make up a pure gourd of wine . Such work of stage to produce maize wine seems simple but you should not try because you would never successful . Many people hard to get the right maize , the right pure water taken from a mountain in Ban Pho but still could not produce the right wine of Ban Pho. People in Ban Pho have possess such as wine distill profession wine since long long ago and surely the have their own secret recipe handed down through generations . And these is just those Mong people of Ban Pho in Bac Ha district could produce such as maize . However Loa Cai has another place where produce similar attractive food delicay . That i San Lung wine . While Ban Pho wine is popular for Mong people of ban pho in Bac Ha district , Sun Lung wine belong to Dao Do people of Ban Xeo in Bat Xat district . It is only different that Ban Pho wine distilled from maize but San Lung wine is distilled from rice and wheat and you will find the production much more complicated : what the rice should be or how is the mixture between rice and wheat ? particularly , the ferment should be made up cautiously from 10 ferment leaves cut from the forest . Taste of this kind of wine is really unique and incomparable . It has a soft aroma and light taste with charming when it touches your tongue . If you want to learn about Lao Cai wine , you should learn how the people there drink it . Ordinarily , you should not say no to honest and sincere invitation. If it is home , a bowl full of tasty and aroma wine offered by house master would be transferred hands by hands around the visitors . The house master would invite you to have the wine and say to you the most hearted-left wishes like the full wine he offer . Muong Hum stream has not only beautified the natural scenery of Bat Xat with a vast resources for hydro electric but also bringing various kinds of fishes among which the Anh Vu fish is the most speciality and delicacy food just for distinguish guest . The Anh Vu fish is little bit bigger than the thumb and has an unusual appearance with big head , wide gills, round body and two blue traces along the two side of the body . with such appearance , local people call it the " Anh Vu diem xanh "
The way to cook anh have a dish with Anh Vu fish very simple anh popular . First , the fish is cleaned , soaked with some spice such as the cardamon , chili , ginger , fish sources anh salt . The fish is clipped between the two bamboo ticks and put on the wooden fire. when it turns yellow with fragrance then the cooking has been done . To enjoy the whole deliciousness of the fish anh the spices, the dish is often served right after cooking is done and the fish is still hot . However , it is much more tasty to have it with wine . Chao Com Vit is traditional food specially for offering to ancestor on rice festival ( Steptember 9 in lunar calendar ) of the Dao people in Bao Yen District of Lao Cai province . It is called the Ca Mao So in Dao language . To have a pot of Chao Com Vit , the cook has to be very careful and skillful to do step by step .Firstly he has to choose the most the plump young sticky rice and roast it up until it turn yellow then unhusk the rice to have viscid and fragrant grains.the following step is choose and slaughter a duck .The Dao people choose the most greasy duck ,slaughter it then boil it with fried cardamoms.When the duck meat has well cooked, it is taken out then pour the young sticky rice into th duck broth ti continue boiling until the rice is soft and the soup becomes viscid and tasty . Dao people choose this kind of soup to respect fully offer to the ancestor during th lunar new year holiday,in the festival and when their family members go far from home wish a wish that their ancestor will support them in life or their members will remember their homes and return soon. After offering to the ancestor, the food wil be served with all family members sitting arround . Duck meal will be eaten with chili salt and doi seed. Children are eager to have this food and always want the festival come soon while adult are more pleasant because this is vision of a happy and prosperous life they wish for.Thus, duck soup with young sticky rice is not only a nutritious food but also has a sacred concept of life of Dao people . Along with Cuon sui, Thang Co , San lung wine ... Duck soup of young sticky rice is turnin into a favourite food popular for many others peoples in Lao Cai while still keep its own special characters of the Dao people . One of the traditional agricultural products of Lao Cai People cultivated on slopping land is the sticky rice with grains are plump and brights. On the occasion of rice festival (in September of lunar calendar ) . 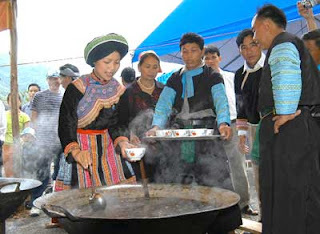 people in mountain region of the Lao Cai cook steamed sticky rice for respectfully offering to their ancestor as a way to thank them for a bumper crop . It 's called Xoi Ngu Sac because it is a food with five colours of white,red,green,yellow and violet symbolising the earth ,heaven, plants and human love. Those colours are created by forest leaves, medical herb or spices leave. The green colour for example , is created by ginger leaves, yellow is made from fresh saffron. Before steaming ,sticky rice i deeply soaked into such colour liquid until th grain has such apperance. The rice is poured into wooden jug and then steamed up . When the steaming is done , the sticky rice has not only appearance of five colours but aroma of all kinds of leaves. Along with the aim to use colours as a symbols of religious believes , ethnic people considers such leaves as value medicine very good for their health. "Thang Co" is an usual dish appeared just in the mountain of Lao Cai long long time ago and no one know where it is from . It was probably originated from China because it is popularly sold in Ma Quan street in the China's border area next the Muong Khuong district in Lao Cai province . The dish sold there is called Tang Ku in China language or Thang Co when translates into Vietnamese. However, some say it might also be created by our Vietnamese people. In fact , Thang Co is kind of food made by meat well-cooked with others spices such as : cardamom, ginger, star aniseed and cinnamon ... 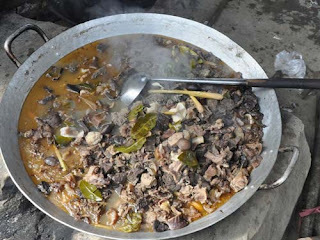 The food is mixture different kind of meat chopped from internal organs and head parts of pork ,horse and goat. If you wan to enjoy the most delicious taste of the Thang Co, you should come to market early in the morning and arrive there time when the Thang Co dish has been finished .It is the most favourite food for friend in a wine drink because it makes the drink unforgetable and much more meaning when thay have it with maize wine of Ban Pho in Bac Ha or San lung wine in Bat Xat . On the market day on mountain region, there are usually seven big pots of Thang Co including those cooked of horse, pork and goat meat .For gastronomes Thang Co of horse meat is the most favourite dish because it comprise all feature of the food : the tasty favour of horse meat including internal organs and blood of horse . At the market, enjoying food people there can have chance to meet their friend and relatives talking around the Thang Co boiling pots and learn experiences about how to work and earn a living . This is also a chance for men to go to the market and have Thang Co.
Nowadays , Thang Co has appeared not only in the market in the mountain but also in luxurious hotel and restaurant in Lao Cai township. However having Thang Co on the market- day would be more interesting and charming because you would find the real life of ethnic people in region .